Many new puppy owners ask us what they should get before (and after) they get their puppy. Below you will find a quick checklist, and also a Shopping List of specific products and links to Amazon. Your puppy will be eating puppy food (AKA kibble) - and we will post this info via an informational email, and you will receive a ziplock bag of some to get you started. Links to the food are below. Canned pumpkin, plain greek yogurt, and plain peanut butter - for crate training and boredom buster with Kongs! Rawhide (only under close supervision). Doodles are infamous for eating socks and other small undergarments - be careful! Squeakers and stuffing and rope toys should all be carefully monitored. Your puppy will be eating one of the below puppy foods. Please ask us which or refer to the Litter webpage to determine what you should order. You should keep your pup on the same kind for at least a couple of months so that they don't get an upset tummy from being switched. Do not switch food on your puppy dog without doing so very slowly, gradually. We are happy to answer any questions on this. Your puppy can be switched to adult food around 8 months of age. As of November 2018, we have changed our adults' food to RAW instead of kibble due to recalls and vet suggestions that grain free is not good for the heart. We are now feeding our adults the raw Stella & Chewy brand. We are also avoiding all things poultry and focusing on fish, beef, bison, and venison. We also put Missing Link Skin and Coat supplement on their food, as well as Purina fortiflora (both products are below on the list). In the winter, we add coconut oil. This is the PUPPY one. This is the adult one. We put Purina fortiflora supplement on the puppies' food to help digestion and keep firm stool. In the winter, we add Missing Link Skin and Coat to our adults' food to help them with the winter itches. Coconut oil is another favorite to add. Pumpkin is a great stomach settler. I recommend it on your puppy's food the first couple of weeks of coming to you to help keep stool firm. Like us, when they are anxious, their tummy might be off. You can use it whenever though - you can also pack it into a Kong for a treat. You will find crates on Amazon or Chewy. We like the Petmate Navigator (and now Compass model too which is a few dollars less than the Navigators) brand the best. Why these? -- The door opens both ways and comes off easily (this is really, really handy when training and using a pen with crate inside). They are also the best looking in a field of uglies. ​​ They also come with a 'grow with me' divider. NOTE: We have heard from owners using metal crates that legs and teeth have been broken! We prefer the hard plastic kennel crates over the metal wire ones that puppies can get their legs and teeth stuck in. PLEASE NOTE: some crates come with a 'grow with me' divider and some do not- check descriptions! The Petmate Navigators DO come with a divider, and the doors open both ways and comes off - that is why we like them. This is the 36" one (large), rated for 50 to 70 lbs. This is the 40", (xl), rated for 70 to 90 lbs...... if you have a medium sized dog, you can get this one and be sure that they will have plenty of space when they are older to sprawl out. You will need to use the divider for awhile. (check description to make sure it comes with the divider - if not, but the Navigator not the Compass). These metal crates are not my favorite. But, some people really like them for temporary use - they easily fold up and the tray on the bottom easily comes out for cleaning. If you put a blanket over it, the pup would appreciate that. Be careful with these, as legs and teeth can get caught and broken. An exercise pen to put your puppy in - read our crate/potty training sections! Keep your sanity and get one. They come in different heights - try not to get one too tall that you can't hop over it and not too short that the puppy will jump out in just a few weeks of growth. I use the 24" and 32" and 36" ones (prefer the 24" and 32" best). These are not ideal solutions as they can also trap legs and teeth, but not as much as the metal crates can. I have yet to find a reasonably priced safer alternative to these though. There are all sorts of gates - here are a few. Measure and try to find one tall enough that your dood won't jump over it. Here is a small Playpen that might be of interest/helpful, depending on your home setup. 24" is not that tall, so this would be for a small puppy. We do not use dog beds for the puppies. Puppies will destroy these while they are teething and also they like to pee on cushy things (so don't let them on your couch until you are 100% sure they are potty trained). We use these fleece blankies in the crates and on the floor. They are easy to toss in the wash; much easier than jamming in a dog bed. Trust us - don't buy a bed until your puppy is older! We will give you one that has littermate smell on it to go home with. These Kurgo dog car seats and harness/seat belt we heard about from one of our owners - who mentioned it on the private Facebook group we have, and next thing we know, "everyone" is getting them. You have to buy the seat AND the harness - so both pieces below. My mom uses it for her training puppies to teach them to sit and enjoy the ride and they LOVE it. A cheap seatbelt that goes in the current seatbelt receptacle you would have....these are okay for emergencies and easy carry, but no idea how well they work in an accident. At the least, it'll keep your dog from wandering all over the car and being distracting. Best high reward treat? Boil beef or chicken (or buy frozen meatballs) and cut into little pieces. But, below are some other options. ​These are liver pieces... I know gross sounding, but many training (most?) will tell you to splurge for these - they are much healthier than using bits of hot dog for a training session when you are feeding a lot of treats. What makes a good training treat? Well, preferable something small, that they can eat fast so you don't have to wait for them to chew to go on to the next training command. Also, something that isn't messy on your hands (no idea why people use hot dogs). And that is healthy for the pup. These Zuke's are favorites by RVD owners. These Plato Pet Thinkers last a little longer - a long soft chew with great ingredients. Bully sticks are loved by all the dogs. You should always supervise the chewing of these - and start with allowing only a few minutes at a time to not disrupt puppy's belly. ​We also take the caps and labels off empty water bottles and give the pups the bottles – talk about a cheap toy that they go bonkers for! Careful though to make sure little pieces are not chewed off. These Busy Buddy toys are puzzles that are great to keep your pup busy and clean teeth! Get the refills too! Kongs - don't buy Kongs that are too small because your puppy could swallow it - Large is good for most! Use these to feed your puppy their kibble (ie, their puppy food), and or fill with peanut butter or plain greek yogurt (freeze to last longer) - great reward or time buster in the crate! I suggest ordering 3 to 4. Feed your puppy her kibble in it, put peanut butter in another when you leave, and have one in the freezer full of pumpkin or plain yogurt for backup. They wash in the dishwasher. SNUFFLE MAT! Okay, so these are not treats but these are SUPER FUN for the pups. The game is to hide the puppy food kibble in the interactive pieces on the Snuffle Mat - similar to putting the food in the Kong to keep them occupied. This will also help those that eat their food too fast. Really, a blast! It is also a great way to bond with your puppy - you will show him where to start to find the kibble hidden and help him 'snuffle'. This is a treat 'puzzle toy'. Puppies LOVE it! You put some delicious high reward treats in it, shake it a bit, and give to your pup to roll around until the treats start to drop out. It will keep your pup busy for a little bit. Give to him before you leave the house! You must manage your puppy's time and energy or they will drive you nuts and possibly even keep you up all night. We have these Himalyan Dog Chew "bones" (really yak cheese) on monthly subscription - the adult dogs love them! You can put peanut butter on them, or store them in your dog food container to get a good smell on them. Your vet will tell you to get these Greenies, which supposedly help clean your dog's teeth. We have one dog that likes to swallow these whole, and luckily the formula is easily digestible. As with all hard things, watch your dog when they are chewing on these and take it away if it looks like they are going to swallow large pieces. Snuggle Pet Puppy - has a heartbeat and has been invaluable for the first couple of weeks of bring your puppy to new home - helps them sleep at night so they don't feel 'alone'. Extra heat packs for the Snuggle Pet Puppy - these, in my opinion, are just bonus, but not necessary. We get a kick out of how the Skunk toys are always the puppies' favorite! They also love things that make crinkle noises....here is a long cow toy with crinkly in it that they will love! A puppy loses over 20 baby teeth & grows in over 40 adult teeth from the ages of 4 months to 9 months. That's a lot of movement in the mouth! This teething bundle will help. I think they love the giraffe because it has some fluffy fur on it - definitely another favorite of the pups. You can also wet and freeze the soft toys to help ease gum pain. ​These help with teething and chewers love them. Teach fetch by sitting down on the floor....as your pup grows up, you'll want a ChuckIt thrower to help your arm. There are a ton of fun options, so we will include some basics here. Use basic for puppyhood and then spend on the fun fancy stuff once they are done teething! Basic 6' leash to get started with. This is the same brand of puppy collars that we use and has a lifetime guarantee, even on chewed up items! Lupine is a great brand - and the collar brand your puppy will go home with. Start with a lightweight leash- not a full size 1" one. This is 1/2". If you buy the 1" one and you are getting a puppy that is under 12 weeks old, it will be too heavy/big for them. Easy Walk harness - hands down our favorite way to walk the dogs. Safe, clips in the front, and helps with pulling. Read the directions - the grey goes on the belly. These ones have a clip in the front on the chest, a clip on the back/shoulders, and a handle by the shoulders -- I have just recently been trying these ones out, and I like them quite a bit so far, but I don't have pullers. Still like Easy Walk (above) best! Clip these on your leash - your neighbors will be thankful. If you have sidewalks with salt in the winter... boots are absolutely necessary to protect paws from being burnt/shredded. Depending on where you live, and how many fleas or ticks there are, you might want to do either the collar or the topical...and some people need to do both if they live in a high tick area. Please be careful with the topical as it can sometimes burn - most it doesn't bother, but some do not like it at all on their skin. If you end up with a flea or tick problem, bathe your pup in Dawn dish soap as it is a stunning and deterrent (not a 100% guarantee but it does help get them off and also deter the beasties). Seresto flea collar - Large - they are usually the same price (sizes), so buy the Large and just use the adjusting aspect and trim it - that way if you have a growing puppy, you don't end up having to buy two when the pup grows out of a small. Here is the topical (monthly) ....if you are in a high tick prevalent area, you will want to do both the collar and this topical. Do not use Frontline (unless puppy has mites, then use Frontline for mites) - that only covers AFTER they bite - you want to try to prevent the bite - the bite is what transmits Lyme and other diseases. 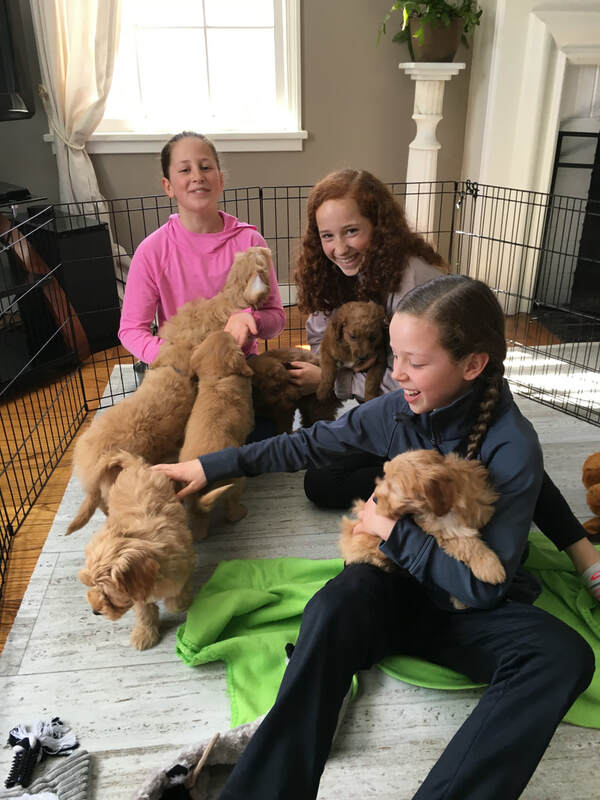 ​Goldendoodle and Sheepadoodle coats are high maintenance and need visits to a groomer (in our opinion), they are also what we call “magic coats” – if they get muddy and you let it dry, it’ll come right off. But they still need to visit a groomer to get matts combed or shaved out and sometimes a doodle likes a short coat because they can get hot. Nature's Miracle - the best shampoo! And, no, we don't get a cut for promoting Nature's Miracle products, but we really do like and use all of their stuff. Ear Cleanser with drying agent - it is important to use the kind that has a drying agent in it. Some of the all natural stuff just makes the pups' ears smell good but doesn't keep it dry. Wetness creates bacteria and yeast, which cause ear infections. Always use this after swimming or a bath! I cannot stress the importance of reading this part - most floppy eared dogs will suffer from an ear infection (or many) throughout their lives. Using this product will save you $$ at the vet because every time you go they charge an exam and the meds. Many new owners are surprised that their groomer needs to shave their doodle down because they did not get to the bottom of the coat and the dog is one big matt. Not good and very uncomfortable. MATS – The most common mistake made when grooming a Doodle or Poodle is to brush over the top but not get in underneath and close to the skin. It can be quite shocking to discover that although your dog looks beautiful ‘on top,’ underneath there is a whole nest of matting you haven’t even noticed or you think isn’t that bad then you take them into the groomers for the first time and the groomer says… “Sorry, we had no choice but to shave them to the skin because they had mats“. Yep, so Goodbye cute Teddy Bear look for at least the next 2 months. Groomers already spend a good 2-4 hours on a regular groom and they will refuse to comb out mats by hand…. this is a huge job. So give your groomer a break and help them out. If you want a longer fluff coat, you HAVE to keep on top of it yourself by using a dematting comb. You can comb out their ears, tails, hips, bodies and feet etc…once a week and save them from being shaved totally pink naked. All of the below have been recommended by our owners - but it is also a personal preference. Start with the first one, the Safari one, and before spending money on another, see if you like it and if it is effective. P.S. it is easier to brush your puppy if he is sleeping! This is for long hair - so if you need to get some mats out, you'll need this kind of metal rotating pin comb for Poodles. Cowboy Magic is amazing to work out mats - smells good too! Many of our doodle owners have said this product has saved their dood from being naked shaved. I used to use it on my horse's tail, but discovered it was good on the doodles as well! You can even put it in your kids' hair for gnarls. Doggie toothbrush - start them young so that they get used to you brushing their teeth! They will loose all their baby teeth anyway, but it helps to get them used to being brushed. Dog toothpaste - brushing won't be too annoying to them when the toothpaste is poultry flavored! Save your wood floors and keep their nails cut often. The more frequently that you do it, the shorter their "quicks" will get and the easier it will be to do. If you are uncomfortable doing this (be careful, you can cut a nerve! ), use your Groomer instead. I don't know why vets give out those dumb big plastic cones - no one likes them. The dogs hate them and they jam them into the back of your legs. These inflatable ones are huge hits and you should have it on hand in case something happens and it is needed asap. Instead of the cone of shame, our owners say these spay/neuter recovery suits are sooo much nicer, and more manageable than a big stupid cone banging against everything, including the backs of your legs. These "lion" cones are a big hit as well. Nature's Miracle Cleaner Spray - sorry but you will need this! Look around for best pricing! You'll want this spray type if you have hardwoods. Do what I do, buy a couple of spray bottles and a gallon size to refill. I was told this Presto Amazon brand paper toweling was comparable to Bounty... not sure! I don't like cheap paper towels. By a YouTube star that people rave about for his great enthusiasm and understanding of dog language....-- one of our pup owners said watching the videos in conjunction with reading the book was the BEST way to learn! It is important to see body language for training. He is a bit dorky, but sweet and enthusiastic! Another great Positive based training book that reviews mostly puppy training. Goldendoodles - if you look close enough, you will find us in here! The furbo is cute, but a splurge. MUD - will drive you crazy! These mats are a saver - we line our patio and garage doors with these to get most of it off before they come in. We also use them in our vehicles. You can also put it in your dog's crate. These things are GREAT! The poofy fabric helps rub off dirt, and the fabric is holds a ton of water. Medium size is not that big but handy. Large Size is normal doormat size (...this is the size I get). This Soggy Doggy paw wiper is great for wet paws before coming into the house - and also wipes up the belly which gets quite dirty on walks too. Keep it at the door! Doodle coats are fun, but messy! Backseat cover. Thank me later. ;-) There are many kinds of these. Because poop happens! Never be caught with just one either. We use this for our yard - far better than bending over! PINE LITTER PELLETS - some of the puppies are litter trained. Pine or soft wood pellets is what they will use. If you have allergy concerns, and you're allergic to hay, you might want to skip using these. There are also PAPER pellets available to use, but the pups are used to pine. Otherwise, they are a dream come true for apartment dwellers or those that are being really careful and keeping their puppy off the sidewalks for the first month or so. This will also help you potty train outside - take the box outside when you're ready, or a pile of pellets. -- she puts it in a 28qt 'under bed storage' that is about 5 1/2" tall - don't get one too tall or little pupper can't jump into it. Let them pee in it for a couple of days, and scoop out poop - and then toss it and put in fresh. Chewy.com also has a litter called Second Nature dog litter that is pretty good - it is low dust tracking. Also a Top Paw Tray with mesh is sold at Petsmart (dog potty tray) is one that our trainer, Joell, likes. The litter pan is just an under the bed plastic thing, about 4" in height. Wee Wee Pads - depending on how far potty trained your puppy is, you may or may not need this. Most likely, you will - any puppy under 3 months old probably needs more potty training and some months longer. Some of our puppies are LITTER trained and not used to potty pads. Indoor Dog Potty Tray - owners, especially those in urban areas, have told us that these trays are great for training and also emergencies. You can also put the Wee Wee Pads in them so that the puppy doesn't chew up/play with the wee wee pad - which they love to do! We use this with the puppies until a certain age so they know what a potty tray is for! Potty training bell to hang on your door - take your puppy's paw and tap it on the bells every time you go out - very quickly, your puppy will understand to tap the bells to let you know he has to go out. Be careful though - the puppy might start dinging the bell just for the fun of it. It's a good way to get started! A water travel setup for your pooch - love this! We love to hike, so we take these bowls for the dogs and they are hardly any added weight or inconvenience to bring along. If you live in NYC where the sidewalks are roasting in the summer and full of burning salt in the winter (very bad on dog paws), you will want to buy boots. You are probably best off going to a pet store and figuring out the sizing there. 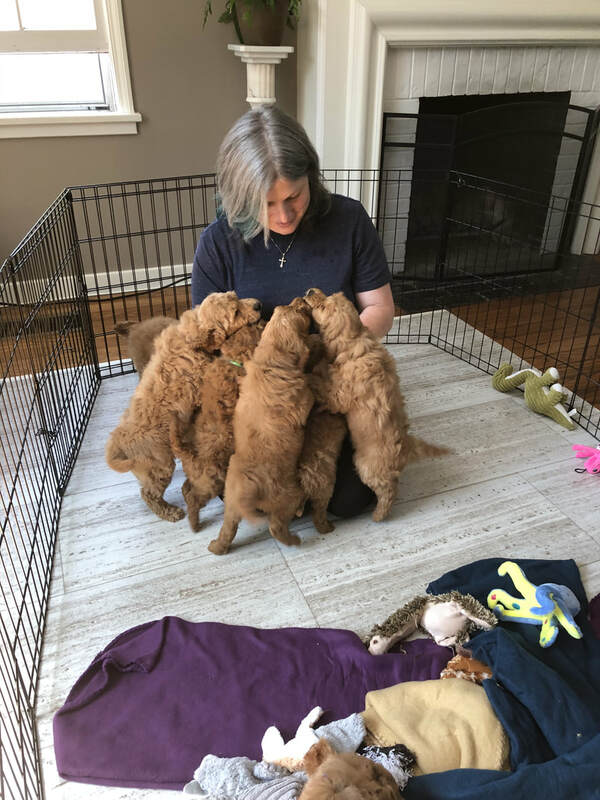 While we like to use the Kongs to put the puppy kibble food in, so the pups have something to do, to "hunt" for their food - you might always want to get food bowls. There is some science that says elevated bowls are best and another set of science that says they are not. Buy what you like.... or no bowls at all and just spread the kibble around their pen and crate! Having food in their area will help with potty training as they don't like to potty where they eat. We prefer stainless steel bowls - not plastic or rubber, and not porcelain (some dogs are allergic to rubber and some pups will break porcelain playing). Stainless steel is the easiest to sanitize! It is NYS Ag law, for us, that we keep our food in closed bins - we don't open a bag and leave it that way - this keeps critters out and the food fresher! Here are several options. Pick one that is at least 30lb food bin because most dog food bags that you will buy will be around 18 to 42 lbs. In addition to the dog food kibble being in the bin, I put the opened bags of treats in the bin as well! This is what we use to take along on walks and outdoors to "treat" reward the pups. It's a great pouch and perfect for training and carrying extras, without being too bulky. Dry or sun burnt noses will appreciate this Snout Soother. It is all natural ingredients and oils, and edible! 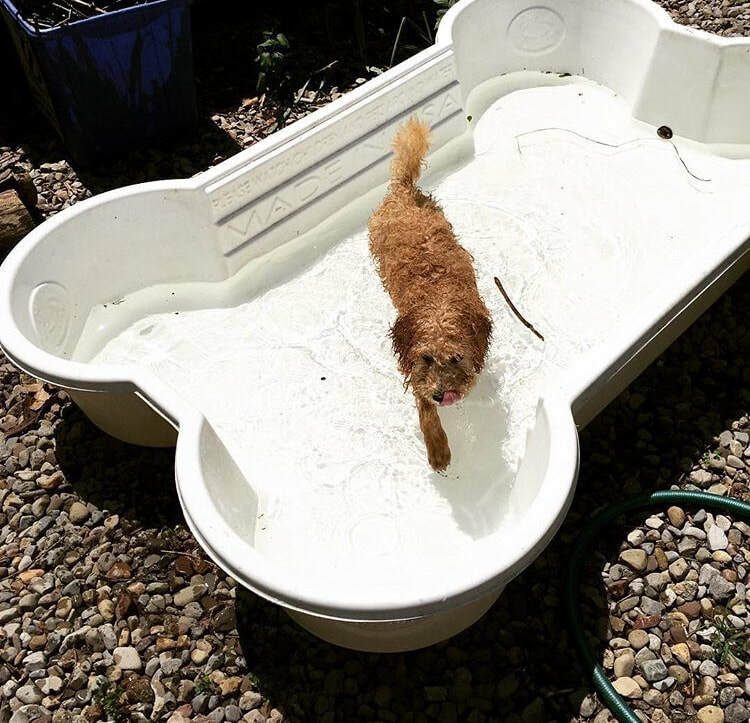 This is my bone pool - love it but I'm a little embarrassed at what I paid for it ;-) --- with that said, it is so sturdy, thick, that I'll use it forever and pass it to my heirs. I mean, really, the best place to shop for custom Doodle gifts is on Etsy! Some really cute stores there!